There was once a boy who was afraid of the dark. He thought that when it was dark his bedroom filled up with monsters. But there came a time when he was too old to be allowed to keep sleeping with the light on. That first night he was paralysed with fear, his mind full of monsters. So much so, that he went over to his wardrobe to get a torch. But when he opened the wardrobe door he came face to face with a monster, and he let out the loudest scream in the world. 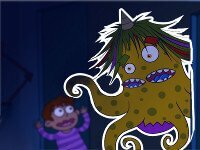 The monster took a step backwards, grabbed its multicoloured hair with its tentacles and... started crying! The monster cried for so long that the boy's shock and fear subsided. He calmed the monster as much as he could, and started talking to him, asking him why he was crying, and what he was doing there. The monster told him he lived in the wardrobe, but almost never went out, because he was afraid of the boy. When the boy asked him why, the monster told him the boy's face seemed to him the most horrible thing he'd ever seen with eyes, ears and a nose. The boy felt exactly the same way about the monster, who had an enormous head full of mouths and hair. The two of them talked so much that they became quite friendly, and they realised that both of them had been afraid of the same thing: the unknown. To lose their fear all they had to do was get to know each other. Together they travelled the world, seeing lions, tigers, crocodiles, dragons... It was the first time either of them had seen such creatures, but they made the effort to get to know them, and ended up dispelling their fear, and becoming friends. And, although his parents weren't too happy, because they thought he was too old to still believe in monsters, the truth of it was that all kinds of creatures visited the boy's bedroom each night. And, instead of fearing them he had learned to get to know them and befriend them. Do you realize that sometimes we are much more scared of the unknown than of many actually dangerous things? Reflect on those things that make you feel something similar. Do you think that someone who haven't met you before should be afraid of you or your house? Why?